Embarcadero has released a new style for Mac OSX which matches the new Yosemite look in the latest Mac version. The latest style in Yosemite removes a lot of the glass and shadowing from the interface. This new XE7 style brings that same styling to your Delphi XE7 Firemonkey apps. Additionally there is a second style which is a dark version of the style. It is similar to the existing Jet premium style except that it has most of the shadowing removed. Sarina DuPont from Embarcadero has a blog post up where she explains how to use this new style. Basically you drop a TStyleBook on the form and then load the Yosemite.fsf file into it. You then add some code in the TForm.OnCreate event which detects what version of Mac OSX the application is running on and assigns the Stylebook of the form if it is the Yosemite version. These styles should probably also work in Appmethod. 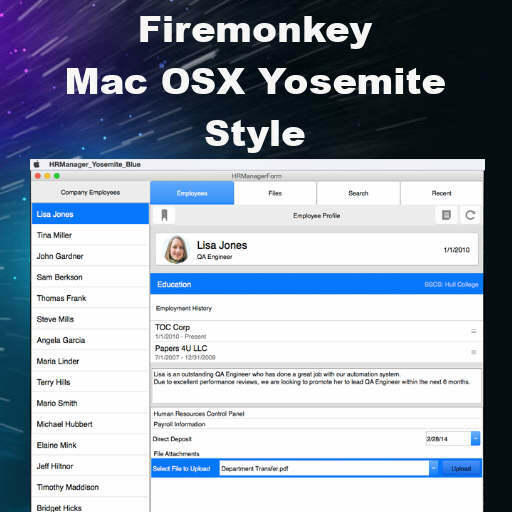 Head over and check out the full blog post about the new Yosemite styles for Delphi XE7 Firemonkey. Head directly to the Embarcadero Code Central and download the new Yosemite app styles.